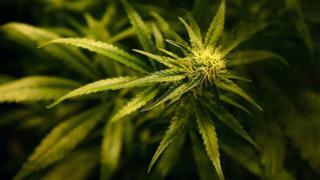 Legalising cannabis could net the Treasury £1bn a year in tax revenue, a report backed by some MPs has claimed. The Adam Smith Institute, a free-market think tank, said the UK's policies had failed to stop the production and use of cannabis or the associated crime. Its report said the UK should follow the lead of the US, where four further states legalised marijuana in this month's elections. The Home Office said it had no plans to legalise the "harmful drug". Former Deputy Prime Minster Nick Clegg and former health minister Norman Lamb are among a cross-party group of MPs that have backed the report. The Tide Effect, which was compiled with VolteFace, a drugs policy think tank, called for "root and branch" reform to legalise and regulate cannabis to ensure it meets acceptable standards and to remove the market for criminal gangs. It said a legal cannabis market could be worth £6.8bn to the economy annually, potentially raising between £750m and £1.05bn in tax revenues and reduced criminal justice costs. The number of offenders in prison for cannabis-related offences in England and Wales would also likely drop from the current 1,363, who cost taxpayers £50m a year, the report said. It comes as Germany is about to legalise cannabis for medical purposes while Canada prepares for decriminalisation of the drug. The Netherlands effectively decriminalised cannabis decades ago while in 2001 Portugal changed the law to turn possession of drugs into an "administrative offence", sending those caught with drugs for personal use to a "dissuasion board" rather than face prosecution. Mr Clegg said: "British politicians need to open their eyes to what is happening in the rest of the world. "Cannabis prohibition is being swept away on a tide of popular opinion and replaced with responsible legal regulation. "Now is the time for ministers to start writing the rules for this legal market, including age limits and health warnings, so that we can finally take back control from the criminal gangs." The report said regulation was "substantially more desirable" than simply decriminalising the drug or unregulated legalisation. Regulation would remove gangs from the sale and production of the drug, ensure the product meets acceptable standards and raise money through taxation, it said. It also said a proportion of tax revenues from the sale of cannabis could be invested back into public services, particularly for those most vulnerable to the negative impacts of its use. Image caption Former deputy prime minister Nick Clegg called for ministers to "take back control from the criminal gangs"
Report author Boris Starling said the advantages of a properly regulated cannabis market "far outweigh the disadvantages". He said attempts to control consumption through prohibition did not work and "have not done so for many decades". Mr Lamb said: "Prohibition is harmful and counter-productive, helping neither to reduce drug use nor the risks to public health." A Home Office spokeswoman said: "This government has no plans to legalise cannabis. "There is a substantial body of scientific and medical evidence to show that cannabis is a harmful drug which can damage people's mental and physical health. "The UK's approach on drugs remains clear - we must prevent drug use in our communities and support people dependent on drugs through treatment and recovery."